Democratic Gov. John Hickenlooper (Colo.) announced on Friday he would make a final decision on mounting a 2020 challenge to President Donald Trump by this summer. Hickenlooper, who is term-limited from running again for Colorado governor, appeared on Kaiser Health New's "What the Health?" podcast along with Montana Gov. Steve Bullock (D.) to discuss initiatives his administration has taken to expand access to healthcare. In light of increasing speculation that Hickenlooper, who has long been floated as rising star within the Democratic Party, has aspirations for the White House, he was asked what his political future would entail when he leaves office in January 2019. The governor asserted that it was a "tremendous compliment" to be considered presidential timber and that he was seriously discussing the possibility of a run with those closest to him. "Every time someone asks the question it is a tremendous compliment and I take it very seriously," Hickenlooper said. "My wife and I have been talking about it for a couple of months and talking to old friends whose opinion we respect and trust." Hickenlooper added that a final decision was likely to come about sometime during the summer. "We're going to try and sort through it this summer," the governor said. 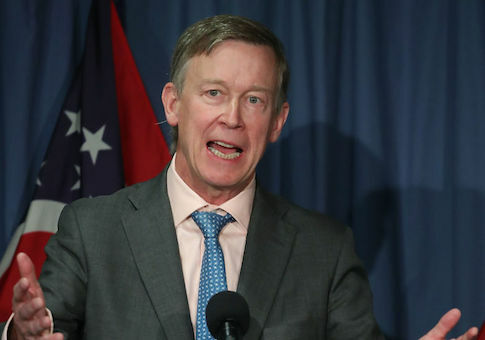 It remains unclear if Hickenlooper, a moderate by most standards and little unknown outside of Colorado, will be able to launch a credible campaign for president in what is likely to be a large Democratic field dominated by the likes of Sen. Kamala Harris (Calif.), former Gov. Deval Patrick (Mass. ), former Vice President Joe Biden (Del. ), and Sen. Bernie Sanders (I., Vt.). Given the governor's record of electoral success in a prime swing state, Hickenlooper was a considered a potential vice presidential nominee for former Secretary of State Hillary Clinton during the 2016 presidential election. Clinton was forced to eventually pass-over the governor in favor of Virginia Sen. Tim Kaine (D.) after Hickenlooper's pro-fracking environmental record drew rebuke from progressive activists. The fracking issue has been a fraught one for Hickenlooper, dividing his political base within Colorado and opening him to attacks from the left as being in the pocket of the energy industry. In the lead up to November 2016, when a Democratic victory appeared inevitable, the fracking issue reared its ugly head once more when environmentalists and progressives attempted to block Hickenlooper from being considered to lead the Department of Interior in Clinton's cabinet. Since 2016, the governor has taken an increasingly higher-profile at the national level. In August 2017, Hickenlooper teamed up with Gov. John Kasich (Ohio), the failed 2016 Republican presidential candidate, to push a slate of health care policies heralded by a slew of bipartisan governors from across the country to fix ObamaCare. The effort fueled speculation that Kasich and Hickenlooper, both viewed as centrists within their respective political parties, were entertaining the idea of running together in 2020 on a political unity ticket. In January during an appearance on MSNBC, the governor weighed in on the immigration debate by calling for comprehensive immigration reform. This entry was posted in Politics and tagged 2020 Election, Colorado, Democratic Party, Donald Trump, Energy, Fracking, Hillary Clinton, John Hickenlooper, President Trump. Bookmark the permalink.